Adjust oven rack to middle position and heat oven to 475 degrees. Line rimmed baking sheet with parchment paper. Whisk flour, baking powder, baking soda, sugar, and salt together in large bowl. Stir buttermilk and melted butter together in 2 cup liquid measuring cup until butter forms clumps. Add buttermilk mixture to flour mixture and stir with rubber spatula ¼ cup dry measuring cup, drop level scoops of batter 1 ½ inches apart on prepared sheet. Bake until tops are golden brown, rotating sheet halfway through baking, 12 to 14 minutes. 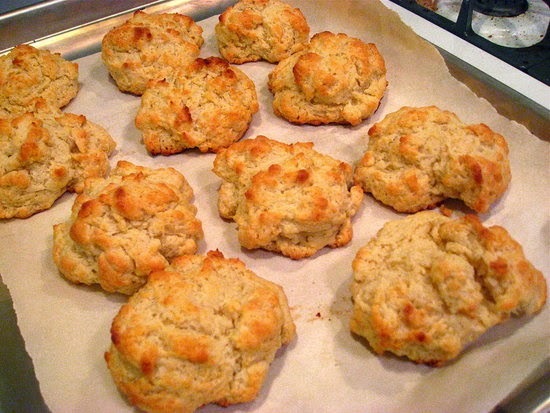 Melt remaining 2 tablespoons butter and brush on biscuit tops. Transfer biscuits to wire rack and let cool for 5 minutes before serving. In step 1 add ¾ cup shredded extra sharp cheddar cheese and ¼ cup finely chopped jarred pimentos to flour mixture. In step 1 add 1 tablespoon minced fresh dill to flour mixture and 2 tablespoons whole grain mustard to buttermilk mixture. In step 1 add ¼ cup finely chopped pitted kalamata olives and 1 ½ teaspoons minced fresh rosemary to flour mixture.